Eighth-century legend tells of a Javanese priest, Rsi Markendya, who meditated at the confluence of two rivers (an auspicious site for Hindus) at the Ubud locality of Campuan. Here he founded the Gunung Lebah Temple on the valley floor, the site of which remains a pilgrim destination. In the late nineteenth century, Ubud became the seat of feudal lords who owed their allegiance to the king of Gianyar, at one time the most powerful of Bali's southern states. 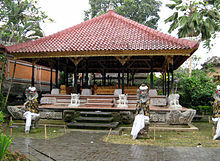 The lords were members of the Balinese Kshatriya caste of Sukawati, and were significant supporters of the village's increasingly renowned arts scene. Tourism on the island developed after the arrival of Walter Spies, an ethnic German born in Russia who taught painting and music, and dabbled in dance. Spies and foreign painters Willem Hofker and Rudolf Bonnet entertained celebrities including Charlie Chaplin, Noël Coward, Barbara Hutton, H.G. Wells and Vicki Baum. They brought in some of the greatest artists from all over Bali to teach and train the Balinese in arts, helping Ubud become the cultural centre of Bali. A new burst of creative energy came in the 1960s after the arrival of Dutch painter Arie Smit (b. 1916) and the development of the Young Artists Movement. The main street is Jalan Raya Ubud (Jalan Raya means main road), which runs east–west through the center of town. Two long roads, Jalan Monkey Forest and Jalan Hanoman, extend south from Jalan Raya Ubud. Puri Saren Agung is a large palace located at the intersection of Monkey Forest and Raya Ubud roads. The residence of Tjokorda Gede Agung Sukawati (1910–1978), the last ruling monarch of Ubud, it is still owned by the royal family. Dance performances and ceremonies are held in its courtyard. The palace was also one of Ubud's first hotels, opening its doors back in the 1930s. A number of Hindu temples exist, such as Pura Desa Ubud, which is the main temple, Pura Taman Saraswati, and Pura Dalem Agung Padangtegal, the temple of death. The Gunung Kawi temple is the site of the royal tombs. 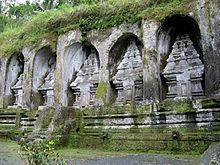 Goa Gajah, also known as the Elephant Cave, is located in a steep valley just outside Ubud near the town of Bedulu. The Moon of Pejeng, in nearby Pejeng, is the largest single-cast bronze kettle drum in the world, dating from circa 300BC. It is a popular destination for tourists interested in local culture. The economy of Ubud is highly reliant on tourism which focuses on shopping, resorts, museums, yoga, and zoos. In contrast to the tourist area in southern Bali, the Ubud area is less densely populated by locals. However, tourists far outnumber locals, with the Gianyar regency seeing 3,842,663 tourist arrivals in 2017 - 1.3 million alone visiting Ubud's Monkey Forest . The town and area has a number of art museums, such as the Blanco Renaissance Museum, the Puri Lukisan Museum, Neka Art Museum, and the Agung Rai Museum of Art. The Museum Rudana in Peliatan is nearby. The Tek Tok is a traditional Balinese dance that is accompanied by musical sound of mouth 'Tek Tok' altogether with various combinations of body movement and other sounds. The story Draupadi Parwa told in the Tek Tok Dance tells a moral message, when a woman who embodies the values of patience, sacrifice, compassion, devotion, and holy sincerity is disrespected, then disasters and calamities will befall a kingdom or state. This story also conveys the message that truth, virtue, devotion and genuine compassion will always be protected by God. The Tek Tok dance performance is held regularly at the Bali Culture Center (BCC) in Ubud four times a week. Ubud Writers and Readers Festival (UWRF) is held every year, which is participated by writers and readers from all over the world. The Campuhan ridge walk is a hill in nearby Campuhan, from where one can see two rivers, Tukad Yeh Wos Kiwa and Tukad Yeh Wos Tengen, merge. A one meter wide paved-block track runs about two kilometers to the top of the hill. ^ "How Ubud became the holistic heart of Asia". SBS. 2016-02-02. Retrieved December 31, 2018. ^ "Jumlah Penduduk Menurut Jenis Kelamin di 2010-2020". Badan Pusat Statistik Kabupaten Gianyar. Retrieved 25 January 2019. ^ "2017, KUNJUNGAN WISATAWAN KE GIANYAR CAPAI 3,8 JUTA". Tribunnews. 2018-04-19. Retrieved December 31, 2018. ^ "Ternyata Wisatawan Lebih Banyak Berkunjung ke Ubud Dibandingkan Denpasar". Tribunnews. 2018-08-27. Retrieved December 31, 2018. ^ Jacobs, Harrison (Jun 23, 2018). "'Why should we make foreigners rich? ': Taxi drivers are taking on Uber and Grab in Bali, and some are turning to violence". Business Insider. Retrieved Feb 10, 2019. ^ "What you need to know before going to the Monkey Forest in Ubud, Bali". Unofficial Guide Philippines. 2018-09-18. Retrieved 2018-09-03. ^ "Sacred Monkey Forest Ubud Sanctuary - Mandala Wisata Wenara Wana - Padangtegal Ubud Bali". Desa Adat Padangtegal. Archived from the original on 2009-04-15. Retrieved 2009-06-21. ^ Cronshaw, Damon (2016-03-15). "NSW man faces rabies risk after monkey bites in Bali". The Sydney Morning Herald. Retrieved 2018-09-03. ^ Tri Hatma Ningsih (August 27, 2014). "Yuk Mendaki Bukit Cinta". Wikimedia Commons has media related to Ubud. This page was last edited on 4 April 2019, at 10:25 (UTC).